Center of Brenham hospitality for 122 years. Originally a two-story log stage depot adjoined by a log cabin complex called the Washington County Hotel. Changed owners several times through the years. General Sam Houston once stayed here while campaigning against secession. 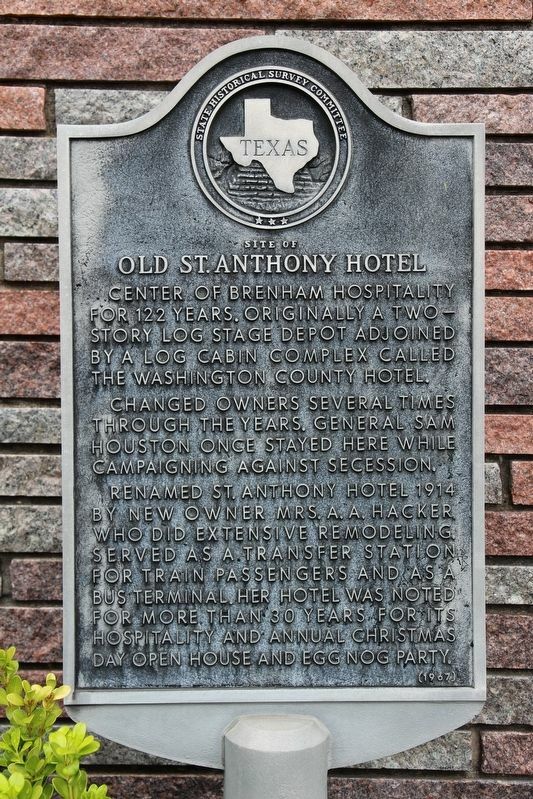 Renamed St. Anthony Hotel 1914 by new owner Mrs. A. A. Hacker, who did extensive remodeling. Served as a transfer station for train passengers and as a bus terminal. Her hotel was noted for more than 30 years for its hospitality and annual Christmas Day open house and egg nog party. Location. 30° 10.075′ N, 96° 23.768′ W. Marker is in Brenham, Texas, in Washington County. Marker is at the intersection of East Main Street (State Highway 105) and North Market Street, on the right when traveling west on East Main Street. Touch for map. 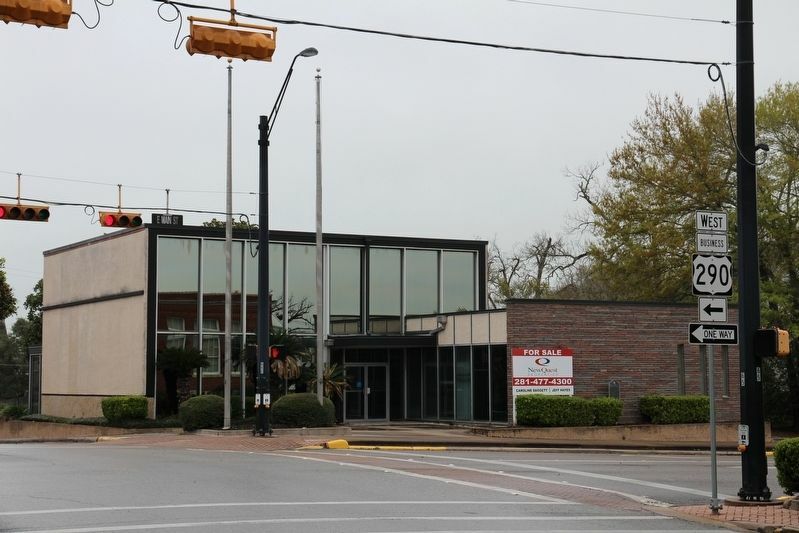 Marker is at or near this postal address: 301 East Main Street, Brenham TX 77833, United States of America. Touch for directions. distance of this marker); Washington County, C.S.A. (about 600 feet away, measured in a direct line); Washington County Courthouse (about 600 feet away); Texas Confederate County Commissioners Court (about 600 feet away); The Brenham Maifest (about 700 feet away); Former Bank Building of Giddings & Giddings (about 700 feet away); Schmid Bros. Building (approx. 0.2 miles away); Brenham Normal and Industrial College (approx. ¾ mile away). Touch for a list and map of all markers in Brenham. More. Search the internet for Site of Old St. Anthony Hotel. Credits. This page was last revised on March 20, 2019. This page originally submitted on March 11, 2019, by Brian Anderson of Kingwood, Texas. This page has been viewed 36 times since then. Photos: 1, 2. submitted on March 19, 2019, by Brian Anderson of Kingwood, Texas.